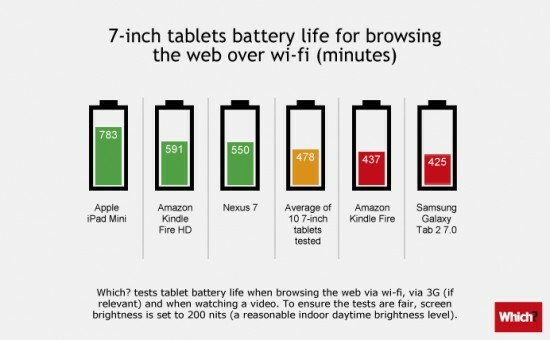 Especially with the 7-inch tablet, the table has definitely right: the iPad Mini is also my experience in no doubt the longest battery life in the field. In normal use you get with the 7.9-inch tablet on a good 10 to 12 hours. The 10 inch tablet runs the iPad on the table. 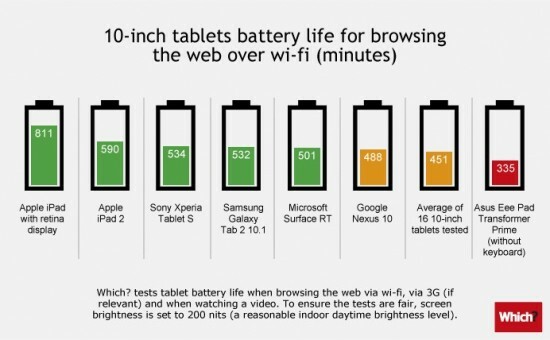 The battery life of the 9.7-inch tablet from Apple is pretty good too, but I'm missing in this list, the Acer Iconia Tab A510 . Which seems to have not tested the A510, at least in their reviews to find anything from the 10-inch tablet. Here, the A510 has a large 9800mAh battery that lasts in normal use 11 to 12 hours. In comparison, no optional keyboard docks were included, which for example, the Acer Iconia Tab W510 or ASUS Transformer Pad TF300T are and where most of a second battery is included. However, this was on purpose, because not everyone can do with such a little dock.